Please note this is NOT a complete pattern: this is an EXPANSION PACK for my Gingerbread Man pattern. 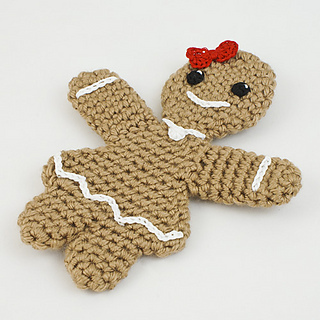 It includes all the modifications required to crochet a Gingerbread Girl with a built-in skirt. Additional info: As with the Gingerbread Man, you can decorate your Gingerbread Girl however you wish. The pattern includes full instructions for the pictured small embellishments, crocheted in embroidery floss with a B US/2.25mm crochet hook. Or, you can make an extra-large Gingerbread Girl (as explained in the Gingerbread Man pattern) with full-size embellishments. 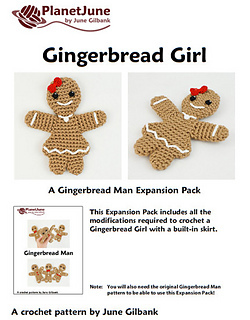 You can buy the Gingerbread Man pattern together with this expansion pack at a reduced price here. 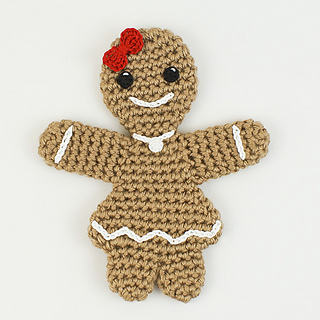 Or if you already have the original Gingerbread Man pattern, the pattern link on this page will let you buy just the Gingerbread Girl Expansion Pack.